KVMGalore today announced that the new 4x1 DVI KVM Multiview switcher from digital connectivity solutions provider Gefen (EXT-DVIK-MV-41) is shipping. This next generation solution in KVM switching is ideal for controlling four computers from a dual display workstation. The operator can observe data from up to four computers on one display, while a second display can be switched to display any image that needs closer attention. 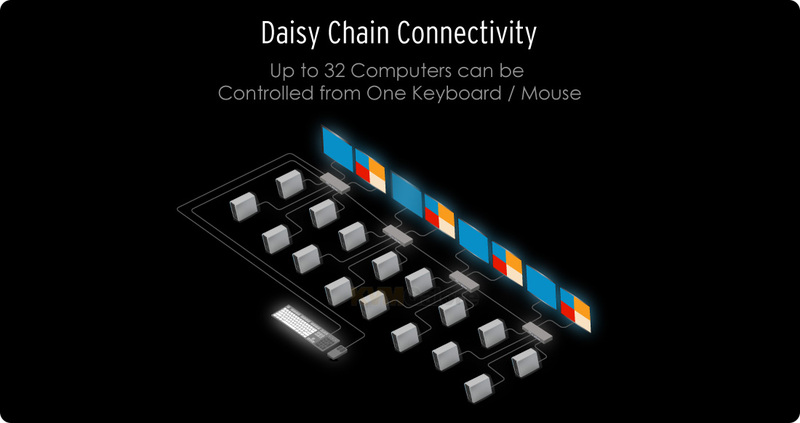 A unique cascading ability allows a system expansion of up to eight switchers accessing up to 32 computers, providing comprehensive control from a single keyboard and mouse. Two front panel USB and bi-directional audio ports (for microphone and headphones/speakers) can be independently routed from any of the computers. Preset and customizable window configurations are readily available, including single screen, split screen, picture-in-picture and four windows on the same display. Both video outputs can be scaled and positioned for the most precise alignment of video on the displays. Gefen’s 4x1 DVI KVM Multiview switcher supports high-resolution video, expands the availability of multiview windows and provides robust routing for seamless connectivity. It provides plenty of options for accessing different computer sources from a single workstation. Flexible control features include front panel buttons, keyboard/mouse control and RS-232. High resolution video up to 1920x1200 or 1080p full HD is supported with HDCP compliance. The product can be placed on a shelf or mounted in a standard 19-inch rack and is field firmware upgradable using the Gefen Syner-G™ software suite.